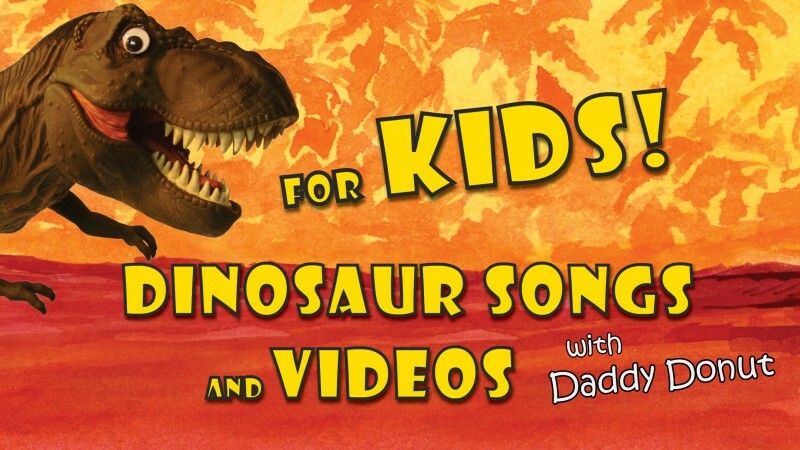 Daddy Donut makes videos for kids – mostly about dinosaurs. Subscribe to the Youtube channel or the newsletter to get a notification whenever there is a new video. On this page you will find a selection of my dinosaur videos for kids. Watch all my Dino Songs with music videos in one clip. In this song we rock our way through the alphabet A to Z with a dinosaur for every letter. It’s probably the best video I’ve done so far. The song is a real rock song, so forget about boring nursery rhymes to learn the alphabet. This is real music for kids. Trixie Triceratops – a funny dinosaur music video about our pet – Trixie Trixeratops. Trixe is always looking for food. Sometimes she can be a handful but the kids really love her. They have a lot of fun together. Triceratops was a dinosaur with horns on its head. But what was the purpose of the different horns? Find out the unbelievable truth in this episode of Dino Park. Learn all about Stegosaurus in this episode of Dino Park – fun facts for kids about dinosaurs. What if a long-necked Brachiosaurus showed up at your (doll’s) house? 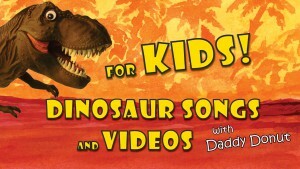 Here is a music video for the dinosaur song “Tyrannosaurus Rex”. It features Grandpa Donut, Kid Donut, cows, sheep, cats and a tractor. Enjoy! This is my first music video for “Dinosaur Songs”. It’s for the song called ‘Running from a T. Rex’. My son is starring as the kid who is being chased by the T-rex. Dinovember is a great thing where toy dinosaurs come to life at night to the amazement of kids worldwide. I felt inspired to write a song about it. I made a video using the original Dinovember photos by Susan and Refe Tuma who started it all. Read more about Dinovember here. In the series “Daddy Donut – Swedish Chef”, Daddy Donut shows us how to prepare a ‘Mole Stew’ – a traditional Swedish dish. But something goes wrong when he leaves the mole unattended. The mole dissapears! The culprit is a hungry little Tyrannosaurus Rex looking for a snack. Before you buy the album, you can listen to all the songs from the album “Dinosaur Songs” on Youtube, they are all available in this playlist. Click here to go to Youtube. You can also listen to a preview of the entire album. Listen to all the songs in just 5 minutes.